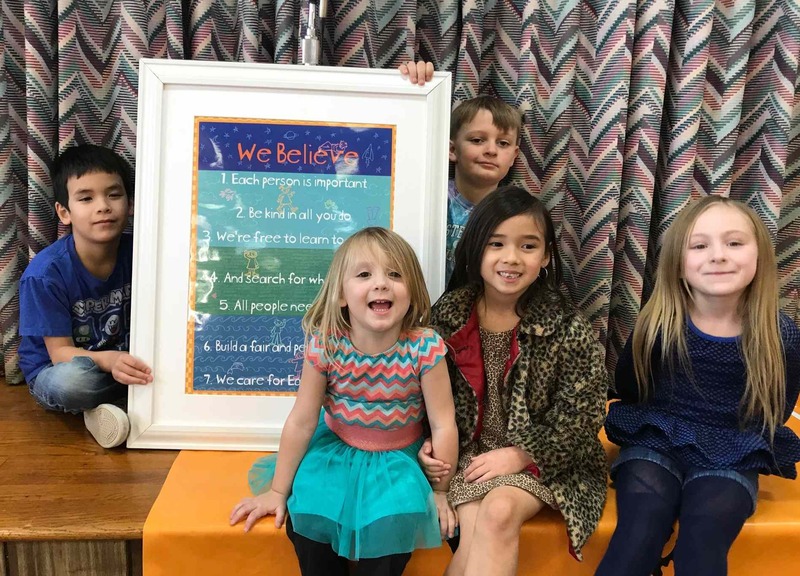 The UUA's "Love Resists" campaign offers social justice resources for Unitarian Universalists and UU congregations, including live and recorded webinars, spiritual resources for social justice leaders, a monthly "Love Resists" newsletter, There's also information about creating Resistance Circles in UU congregations, becoming a sanctuary congregation, and forming social justice partnerships with other organizations and communities. The UUA's Side with Love campaign and Professional Development Office are offering a limited number of scholarships for ministers, religious professionals, and lay leaders who are involved in social justice work to attend social justice workshops and gatherings that will provide rich, meaning-making opportunities for spiritual wellness, healing, and enhancing the skills that will enable them to undertake the long-haul task of justice ministry. Applicants who are not compensated for their justice work will be prioritized. Click the image below to purchase. 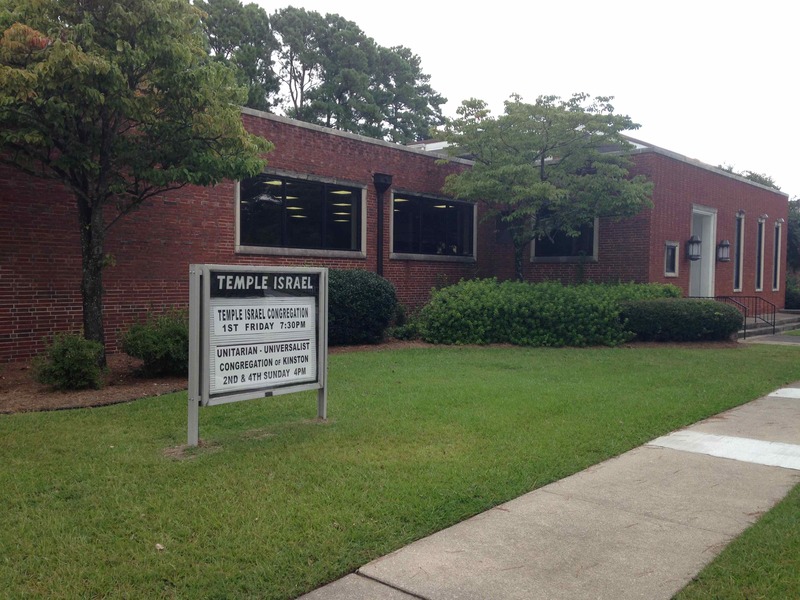 UUCK supports Mary’s Kitchen, located at 110 North Independence Street in downtown Kinston, which provides daily nutritious meals to approximately 110 people. The all-volunteer staff serves six days a week (Monday through Saturday) to anyone in need. Our members support our local Ruritan Club, AARP, Friends of the Library, and NAACP Literacy for Youth. Our congregation contributes to scholarships for Shelter Neck Summer UU Youth Camps, and to the Helen Wright Center in Raleigh, NC. Are you looking for a community where you can explore the common questions of humanity without fear or guilt? Then please visit our growing community - let us see if we can live up to our mission and covenant together! "Our Mission is to love, encourage, and support each other on our spiritual paths." "We covenant to affirm principles of UU faith, walking in harmony with our neighbor congregations, and humanity." We will join in fellowship with neighboring UUs to worship on this special day and will not have programing in Kinston on this day. 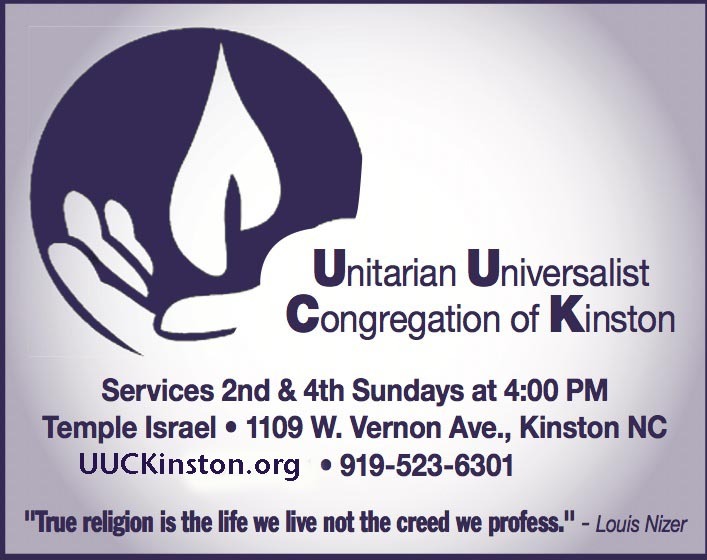 Please join the Unitarian Universalist Congregation of Kinston Sunday, April 21, at 11 am at Outlaw’s Bridge Universalist Church. With spiritual courage Jesus made the ultimate personal sacrifice for his beliefs. What does it mean to liberate that message of love and justice in this new century? Join us to celebrate Easter’s liberating message. 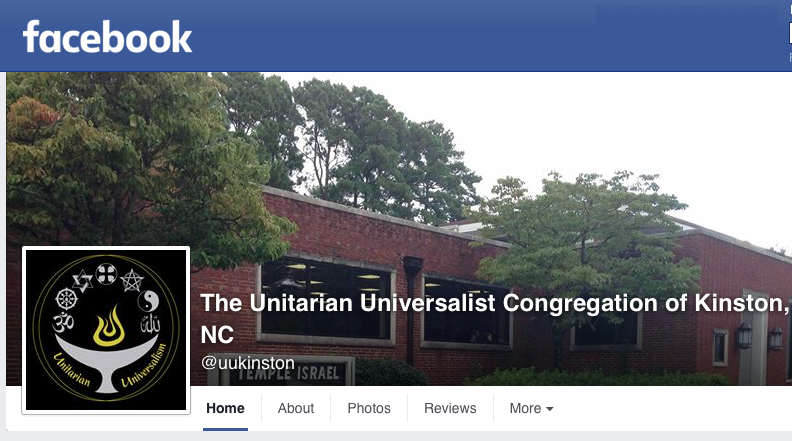 the UU Congregation of Kinston. (except as noted in our schedule). Web Template created with Artisteer by Jack Anglin.